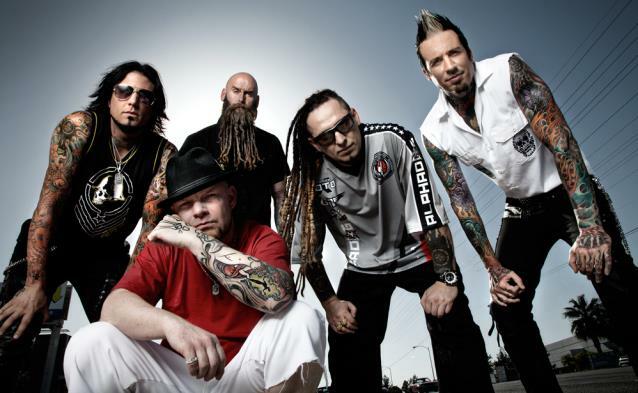 Las Vegas metallers FIVE FINGER DEATH PUNCH have enjoyed tremendous support from their military fans over the years and have decided to give back to veterans and those suffering from PTSD with the video to "Wrong Side Of Heaven", which can be seen below. The clip, written by the band and directed by Nick Peterson, is intended to increase knowledge about the plight of veterans suffering from Post-Traumatic Stress Disorder (PTSD) and its larger repercussions for our country by way of affecting their mental and physical health, family life, assimilation back home after service and garnering quality job placement, among many other issues. "Incredibly touching, I watched with a lump in my throat the entire time. FIVE FINGER DEATH PUNCH's support of U.S. troops and military veterans never ceases to amaze me," said Angel Orozco, former U.S. Marine Corps corporal broadcaster at the American Forces Network (AFN). FIVE FINGER DEATH PUNCH has partnered with a multitude of national and local veterans and PTSD help organizations, contact info for which runs at the end of the video for "Wrong Side Of Heaven" and is also available at 5fdp4Vets.com. The band created this web site to provide a destination with more info on veterans affected by PTSD, the issues they're facing and also to host a video-call-to-action to their fans asking them to send in their fallen loved ones' dog tags to create a memorial wall to commemorate them. The memorial will travel with the band across North America to be the backdrop of the show on their upcoming arena fall tour. Post-tour, the dog tag memorial wall will ultimately find a permanent home in a museum to honor the fallen heroes who gave their life while serving our country. FIVE FINGER DEATH PUNCH has also designed a special, limited-edition No One Gets Left Behind jersey which will be available exclusively via an Indiegogo crowd funding campaign to benefit the various help organizations mentioned at the end of the video. For more info on the memorial wall, mailing address for dog tags and how to participate in the campaign for the jersey, go to 5fdp4Vets.com. Coinciding with the launch of the new video to "Wrong Side Of Heaven", members of the group are visiting Nellis Air Force Base in Las Vegas, Nevada today to meet with 400 airmen for a signing, video screening and to talk about the campaign. Those affected by PTSD, both directly and indirectly, are encouraged to share their stories online using the hashtag #5fdp4Vets. FIVE FINGER DEATH PUNCH is scheduled to kick off the biggest rock tour of the fall, co-headlining arenas across North America with VOLBEAT, on September 16 at the Maverik Center in Salt Lake City, Utah. Hal Leonard will release a brand new FIVE FINGER DEATH PUNCH guitar tab folio tomorrow, August 12. The book features a dozen cuts from the band's current hit albums "The Wrong Side Of Heaven And The Righteous Side Of Hell" Volume 1 and Volume 2.